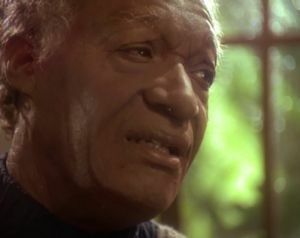 An eldery Jake Sisko explains to a young writer why he quit writing. The actor who plays the older Jake Sisko is Tony Todd, who also plays Worf's brother, Kurn. Todd's make-up is pretty shoddy, but it's hard to deny that he looks a lot like Cirroc Lofton. I'm not sure if the central narrative device upon which the story turns--the young writer showing up the very same night Jake is waiting to say goodbye to his father--is lazy writing or if the writers were going for something a little more fable-esque. On the other hand, maybe Jake Sisko is so ridiculously famous that he has visitors like this all the time, but he usually turns them away. "It's life Jake. You're gonna miss it if you don't open your eyes." Benjamin Sisko is clearly a fan of that great modern philosopher, Ferris Bueller. Jake's got a thing for Bajoran girls, doesn't he? When Ben appears to the adult Jake, it's good he didn't show up a few minutes later, because it's clear that Jake was about to work on making those grandchildren. I have a hard time buying the future relationship between Dax and Bashir. Is this episode making a case for noble suicide? If you look at it from that perspective, this episode is about Jake sacrificing his life for his father, not only with his actual suicide but with the lifetime he spent trying to save him. I wanted to hate this episode, but I just couldn't. It's almost an entire episode devoted to the fake mourning trope I've been complaining about lately, but it manages to be pretty poignant. When Jake tells his father that Jake was "dragging [him] through time like an anchor," it's giving voice to the notion that, when you hold on to the loved ones you've lost, they pull you back and prevent you from living a full life. Sure, it's a little weird that Ben is asking about grandchildren after what, to him, has been only a few moments since he was thrown into subspace, but it's important, thematically, to demonstrate that holding on so tightly you can't move on is probably the last thing the dead would want.